Search engines value unique content. Google and Bing aim to deliver the freshest and most relevant pages to users. That’s their job after all. For websites trying to break ground in their respective industries, content creation is their gateway to a successful online business. The better their pages (regarding quality), the greater the chances they will rank for their target keywords. The higher their ranking, the more visitors they can except to click on their pages. More visitors means more chances to get some new customers! But let’s face it — creating the kind of content that search engines love on a consistent basis is hard. As much as you want to publish comprehensive posts every day, you may just not have the time to create something great from scratch every time. Unless you are working with multiple writers and designers, you need to approach content creation in a different way. This is where content curation truly shines. Let’s find out how and why. By definition, content curation is the process of finding and sharing great content that is both relevant to your business and valuable to your readers. Create quality content fast – Instead of building content from the ground up, you can simply search for published content related to your niche and share them on your site to your readers. No need to spend time researching, writing, and refining your post to communicate your ideas — your curated content will do the communicating for you. Increase your influence – By constantly sharing content that resonates with your audience, you will soon be considered as an authority in your niche. Your ability to spot great content helps establish your knowledge about the subject you tackle in your business. Offer insights from publishers not related to your brand – Publishing content with promoting your brand and increasing sales in mind can be tone-deaf if done on a regular basis. It is best sometimes to feature insights from people not connected with your business to offer fresh ideas to readers. Featuring their posts on your site is one way of doing this. What Does Content Curation Do for SEO? Content curation, when done right, can become a critical part of any SEO strategy. Before we get into that, let’s identify examples of sites that curate content to significant effect. Cool Material is geared towards providing guys with information about the best stuff around. They provide their audience a daily dose of content that their readers will love. They have special sections dedicated to particular days like the Tuesday Link Roundup and Sunday Hangovers. Another example is tech news site Slashdot relies on its team of editors to handpick content from relevant online publications to share on the site. Keep in mind, however, that because both sites mainly on curating content, they don’t create unique content per se. Instead, Cool Material and Slashdot is using its site as a platform to deliver existing content from all over the web to their members. As a result, content curation allows them to connect users to the hottest trends. More importantly, this content marketing strategy allows them to create a fresh page on their sites and rank for particular news items. 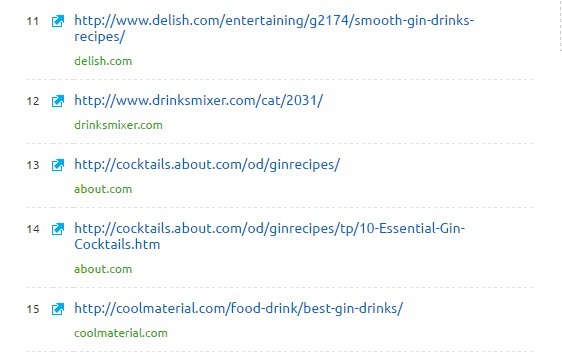 If you search “gin drinks” on Google, this page on Cool Material ranks 15th. I used SEMrush to extract the search ranking for this post. 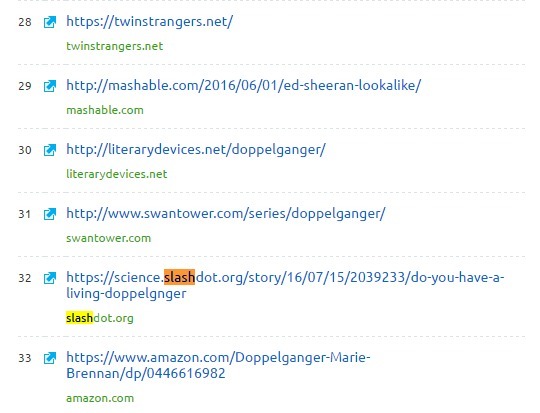 Also, this entry about doppelgangers at Slashdot ranks 32nd for the keyword “doppelganger” after existing for only a couple of weeks. While the ranking may not be that high, the fact that it ranked on the fourth page for a short keyword in a span of a week is impressive enough. While the Cool Material post may not be an example of content curation at work, the post benefits from having been published at an authoritative site. The effects of having done content curation trickles down to other content types, making it much easier for the pages to rank for their keywords. 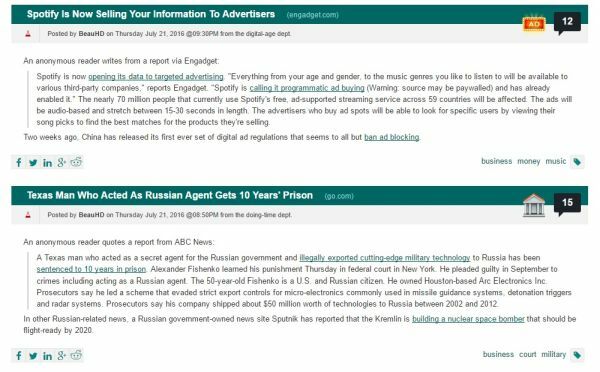 On the other hand, Slashdot is built on content curation and has established itself as an authoritative source for tech-related news for years. Over time, search engines may have considered them authoritative enough, which could have led to ranking their pages high. Not to mention, most of their entries are driven by discussion and engagement among their users. This plays a factor in determining the freshness of the content. Therefore, while the shared content does not make the page unique in the strictest sense, the user comments will do just that. If you are to implement content curation to boost your SEO campaign, you’re going to want to do it like the sites mentioned above. By developing a sustainable content strategy that allows you to curate content regularly, you can boost your site’s search rankings for keyword phrases. It’s a fairly simple process. The hard part is finding a cadence that works for you. For this exercise, you do not have to focus on a target keyword. The important thing to remember when curating content is that it is all about the readers. Your purpose is to deliver the best and most relevant content to them under a particular topic in your business. You can, however, take the route that Cool Material did by labeling your link roundup posts according to day or theme. 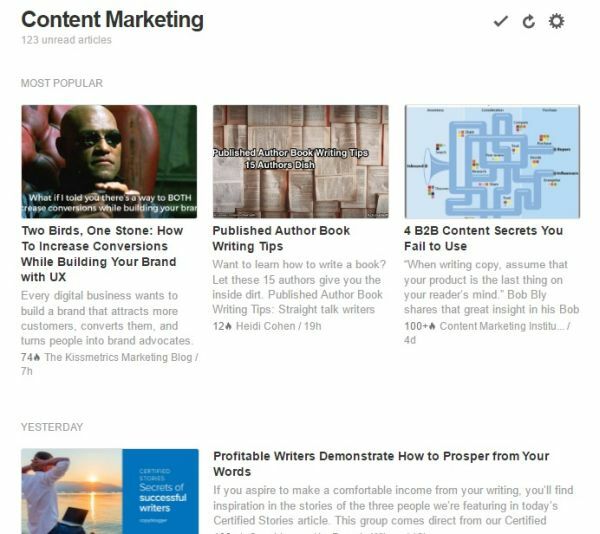 This allows you to categorize your curated posts and make it easier for your readers to find topics that are of particular interested to them. For example, if I want to read link roundups from Cool Material, I go to the site every Tuesday and/or Sunday. Keeping this in mind, you need to learn the tools to use to find content to curate. Searching for content on Google is a good place to start, but you will find yourself manually sifting through the search results to find the best ones, which is time-consuming. To make the content curation process faster, you can start by using Feedly to help you segregate content that you want to share from sites you already love. This RSS reader will help you organize content from the sites so you can simply choose the content to share. The problem with RSS tools such as Feedly is that you can only view content from the sources you have entered in your feed. What if you want to cover trending topics or posts that have yet to go viral? TrendSpottr is an excellent way to identify posts that will soon blow up based on predicted impact in your market. You can also view the latest posts from influencers and thoughts leaders within your niche. The tool is perfect for B2B marketing, based on the topics available. If you want a more flexible and robust platform to gather content from, BuzzSumo is your one-way ticket. You can find the most shared posts on social media and filter the results by date (past week, past six months, past year) and content type (articles, infographics, guest posts, giveaways). You can also see posts for your keyword that are currently trending. 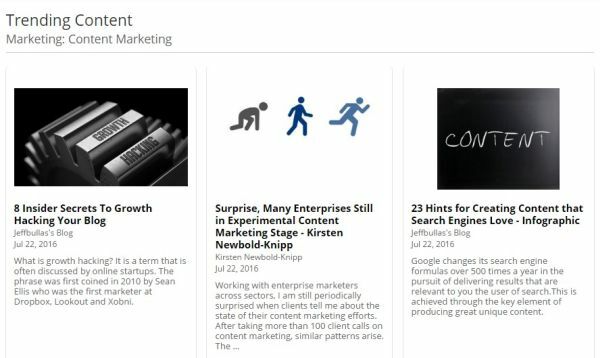 You can create a custom feed for your personalized topics so you can narrow down the content that you want to share. When choosing content that you will share, also consider how much traffic and exposure you will get by featuring them in your post. You want to strike a balance between choosing a great content and an influencer who can help you share your content with its followers. That said, BuzzSumo has also got you covered with that. The rule? Reach out to people who have a substantial amount of Twitter followers, as well as high retweet and reply rates. After zeroing in on the influencers whom you want to target, browse their site and blogs they write for and try to include them in your list of curated content. Once you have the content you want to curate you’ll need to determine how to best feature them on your site. Often, the easiest way to do this is by linking to all the content and including a short commentary on each explaining why your readers should check it out. 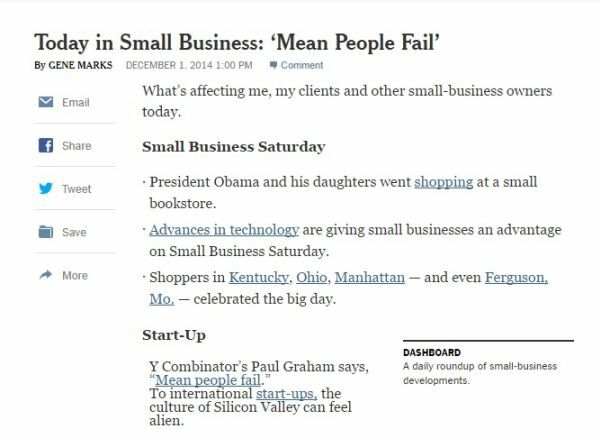 Gene Marks accomplishes this in his This Week in Small Biz section in the New York Times. Once published, you’ll next want to share your post on any number of channels to amplify your reach. Common content marketing promotion applies here. Consider using social media marketing, subscriber newsletters and email campaigns. Going back to the influencers featured in your post, tag them in your tweet and say that you featured them in a post. If you chose the right influencers and you’re lucky, they’ll reply to your message and/or share your post to their thousands of followers. They may even link to your curated content from their own site! If you want to dig into getting included in roundups (another great way to build some search results via content marketing) read this post by Ana Hoffman at Traffic Generation Cafe. Content curation is a tactic to help you shore up your content creation strategy. Using it will allow you to leverage published content that your readers will find interesting. While it is mainly to provide your audience with valuable and actionable content, its effects are felt in the SEO realm as well. By running a solid campaign that allows you to publish curated content regularly, you can drive more referral traffic and get noticed by influencers in your industry. Ultimately, these conditions will increase your businesses reputation and rankings.